From their ecological benefits to the significant savings they can provide on your monthly water bill, there a number of good reasons to consider adding a rainwater collection system to your home. These systems have become increasingly popular in recent years, as many homeowners are looking for creative new ways to minimize their water consumption around the house. 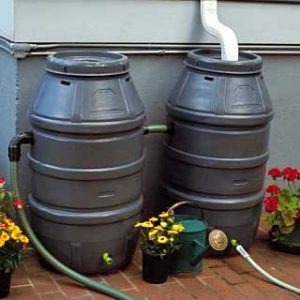 Rainwater collection systems are also ideal for avid gardeners, or for people who live in areas where soil conditions make it difficult to drain large volumes of water away from their homes. Although we often add rainwater collection bins to new seamless gutter installations, these systems can be easily integrated into your existing gutters and downspouts as well. All we have to do is divert the downspout of your choice into two separate pipes. One of these pipes will feed your rainwater collection bins, while the other will carry water safely away from home in the same manner as an ordinary downspout. Once the system is installed, you can select which path the rainwater will take at the flip of a switch. In the event that your rainwater bins become filled with water, you can simply close the downspout diverter to prevent them from overflowing. Otherwise, you can let your gutters fill the bins with free water to use in your lawn and garden. Interested in learning more about the rainwater collection systems we offer at Bell Seamless Gutters? Feel free to give us a call at our toll-free number or contact us online today to speak with a representative!